Here are your Black Friday tips from Rhys Enoch! Ever been browsing online for that dream driver or set of irons and not known where to start? Ever been in awe at the variety of top-quality products available and struggled to make a decision? Well, how about hearing exactly what products work for a professional golfer? 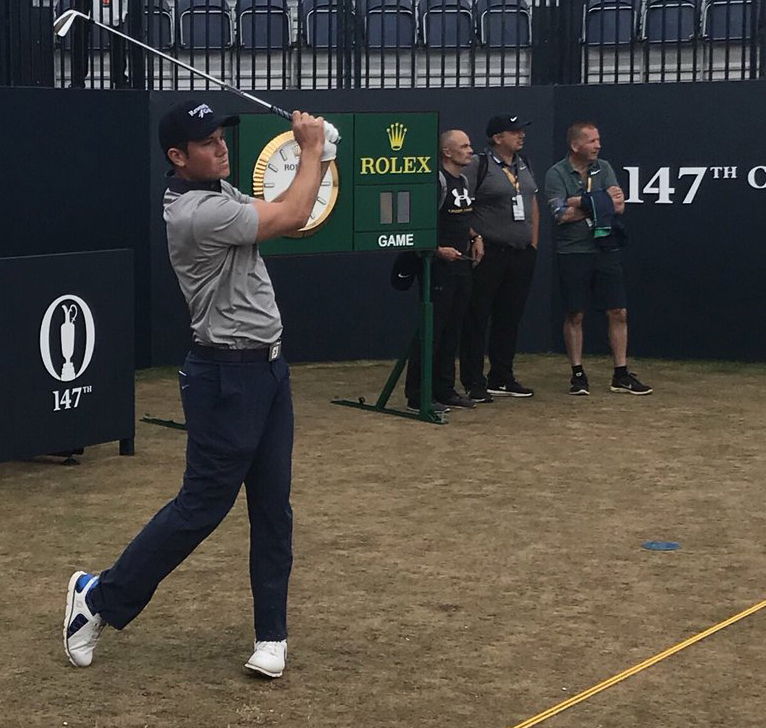 Rhys Enoch, who featured in the final rounds of The Open at Carnoustie this year, has provided some fantastic options below which can be purchased with some of our partners! Would you be able to talk us through your golf bag? What have you currently got in the bag (irons, woods, golf balls) and what would you recommend to golfers? I’m pretty much Titleist head to toe and I’m very happy with it. I use the Titleist TS3 driver which a lot of pro’s are using at the moment. I use the 917 3 Wood and the TMB 2 and 3 Irons. I use the Titleist 818 hybrid and then 718 Mb Irons from the 3 Iron right up to a 9 Iron. All of my wedges are Titleist Vokeys, I have a 46, 50, a 54 and a 58, and then I’ve got a Scotty Cameron putter. Finally, the balls I use are the Pro V1X balls which are very popular. I would definitely recommend Titleist to other golfers, especially the AP2 irons, and these clubs have certainly helped to improve my own game. What gives these irons, woods, golf balls etc the edge over others that you’ve used in the past? I just think it’s a really solid choice, AP2 irons are great if you hit the ball particularly well and the blade is great for players like me who play with a lot of speed. It has been performance enhancing for me in particular and it’s great to have some of the best gear out there. I’m presuming that you are sponsored to wear the golf gear that you have on? Tell us about the golf clothes that you like to wear and what makes them work for you. I have always been a traditionalist really in terms of what I wear. I’ve always liked the look of Titleist and FJ. I enjoy having just the one brand, I’m not one to mix and match but I know some other players have different clothing. I think the clothing looks really smart, it fits really well and if you’re feeling good then you’re going to go and perform better. Rewards4Golf allows golfers to spend their valuable points with golf’s top retailers to gain a discount on their next purchase. If a golfer had £100 to spend, what would you recommend that they buy? It’s a difficult one as there’s a lot of great stuff available. But if I had to pick one, I would probably say a Vokey lob wedge. It’s really important to have the right wedges for your own individual game. I personally go for the ones I have because of the shape of the head but other people may opt for different ones. There are some great options out there and they’re certainly very affordable. Members can also use their points to save on their next golf break or trip away. You must have played some great courses over the years. Are there any particular courses that you would recommend for a golf break? There are some fantastic courses in the UK and abroad and I have played at so many great ones over the years. One that I would definitely recommend is the Monte Rei Golf & Country Club in Portugal, it’s about half an hour outside of The Algarve and up in the mountains. It’s a really great course and the setting is fantastic. Other than that, Belek in Turkey is another great destination. There are about 20-30 courses within a 10-mile radius and obviously the weather is awesome over there! Many of the products recommended by Rhys are available to purchase with our golf retail partners. Click the link below to browse some of his suggestions on the Discount Golf Store website!